Two riveting and restrained French documentaries, Alice Diop's ON CALL/LA PERMANENCE and Claire Simon's THE GRADUATION/LE CONCOURS, caught Jerry Whyte's eye at this year's London Film Festival. Exploring vastly different worlds, an under-resourced health centre and a richly endowed film school, they combine to expose the chasm dividing the top and bottom of society. If there was a more vitally urgent film than Alice Diop's On Call at this year's London Film Festival, pardon us for not catching it; we were too busy weeping. No, make that, 'screaming'. In a programme graced by several spiky protest films, Diop's unheralded, understated gem shone through. Spike Lee's pulpit-pounding comic strip spectacular Chi-raq certainly set the political pulse racing. It goes for black-on-black violence with all guns blazing and makes common cause with Ava DuVernay's no less intelligently incandescent 13th to thoroughly shame Nate Parker's disappointing popcorn potboiler Birth of a Nation. Andreas Dalsgaard & Obadiah Zytoon's The War Show and Eva Orner's Chasing Asylum, meanwhile, provided equally essential contextualising support for On Call with accounts of the crisis in Syria and Australia's disgusting treatment of refuges respectively. Diop's subtle plea for peace and justice feels as personal as the former and as powerfully polemical as the latter. Her clinical examination of the plight of asylum seekers in France seeps into the soul and stays put. 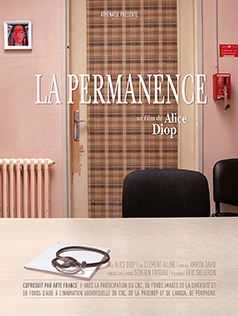 As wave upon wave of suffering humanity washes up, dead or alive, on Europe's increasingly unfriendly and fortified shores, we can but weep for a world riven with racism, violence and injustice but Diop's intimate film forces forth a scream of horror, too, at our disgraceful response to the immense human tragedy unfolding in our times. On Call focuses on an emblematic few from among the millions of refugees driven from their homes by the masters of war and by life-threatening poverty. At the Avicenne hospital in the north eastern suburbs of Paris, Dr. Jean-Pierre Geeraert and his skeleton staff face do their level best to help the steady stream of 'sans papiers' who turn to him in their hour of greatest need. Dr. Geeraert practices in the only drop-in centre in Seine Saint-Denis (setting for Diop's 2011 film The Death of Danton) that offers free healthcare for asylum seekers. Ably abetted by a sympathetic psychiatrist and a gruff social worker, he treats over two thousand patients each year in his tiny surgery. Patients flock to him from far and wide. 'I'm too popular' he wryly remarks. Needless to say the demands on his time, patience and resources are prodigious. Geeraert and his colleagues heroically offer invaluable aid and advice to those facing a no-less heroic daily struggle for survival, all the while facing down not only official callousness and intransigence but a scarcity of resources so severe one neighbouring hospital has run out of money and cannot issue prescriptions, couldn't anyway as it has also run out of as prescription pads. Their patients often arrive broken in body and spirit and regularly relive unspeakable, here largely unmentioned traumatic experiences. One man we meet experiences chronic back pain from a beating he received back home in Africa, where his family have remained; another suffers excruciating chest and head pains resulting from a beating dished out, ten years ago, by the military in his native Sri Lanka. One insomniac South African woman suffers nightmares and frequent panic attacks due to a childhood experience of abuse. We witness one of her attacks and we witness one diabetic man's collapse into uncontrollable tears. We hear their heartrending stories and suddenly the 'refugee crisis' has a human face. While contending with soul-destroying physical, psychological and spiritual pain, many of Geeraert's patients are simultaneously locked in mortal conflict with an unwieldy and, to them, unfathomable bureaucracy so he spends as much time assisting his patients with their paperwork as he does dispensing palliative medicine to alleviate their suffering. Many are homeless as well as stateless, many are forced to sleep on park benches or in railway stations, few have even a rudimentary grasp of French, most are subsisting on a pittance as they await housing or benefits. Geeraert reads the reports on one young man with suicidal tendencies; he has 'No medical care, no job, no home, no family.' He becomes impatient with one patient who repeatedly pleads with him to save his life. Such a litany of misery and complaint must wear him and his colleagues down but, like their patients, they maintain a resilient, stoical equipoise. Their conversations are laced with gallows humour. They respect their patients while demanding ours. This unflashy, uncluttered film introduces us to such desperate but defiant people within the confines of a single shabby room, which expands to stand in for a whole wide world of suffering and violence. The year she spent filming in that room resulted in one of the most deeply felt and moving films of this year's London Film Festival. The six-months she and Amrita David spent in the editing suite paid dividends in a perfectly paced film punctuated with 'black leader' pauses that establish a mesmerising rhythmic flow. Diop's rigorous use of fixed camera positions (no 'wobblyscope' here) and adamant refusal of extraneous music (no strings attached here) enhances the intensity of our experience and consquently increases our levels of empathy. Her patient minimalist approach allows each individual encounter to unfold in unhurried fashion. Each glazed glance of anguish and despair, each bright-eyed eruption of hope and humour, each sob and smile touches us to the quick and forces us to reconsider society's priorities. 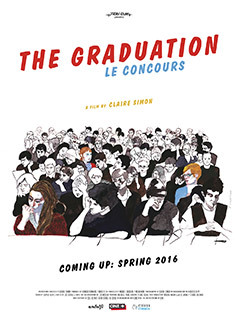 Another expertly edited, elegantly restrained observational documentary, Claire Simon's The Graduation takes us behind the scenes at La Fémis, the elite film school on the site of the former Pathé studios in Montmartre whose alumni include Theo Angelopoulos, Claire Denis, Costa Gavras, Louis Malle and Alain Resnais. Although situated not far from Dr. Geeraert's workplace, La Fémis is a million miles distant in all other respects. While the desperate asylum seekers in On Call wait for homes and help, the well-heeled applicants we meet here wait to see if they've earned their passports to riches and success. 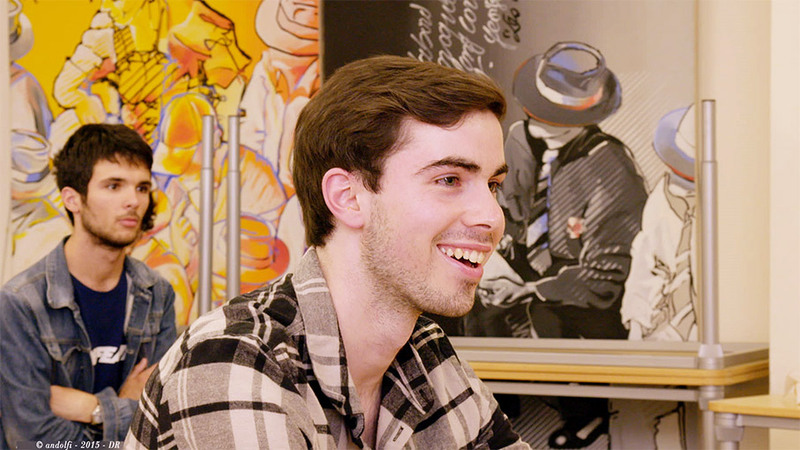 London-born Simon, who works with students of directing at La Fémis, walks us through the intensive three-month long competition selection process. She shows us conversations among applicants, script pitches, panel interviews, and, most crucially, the heated discussions among those appointed to decide between candidates. We come to recognise certain candidates and jurors, much as we come to 'know' certain of Dr. Geeraert's patients in On Call, but this is primarily an institutional documentary of the kind perfected by Frederick Wisemen) so the selection processes are foregrounded at the expense of the participants, about whom we learn very little. Initially, the applicants, all of whom are allocated numbers for purposes of anonymity, view a film and are required to respond to it in writing. Next, they are given three hours to complete investigative film projects of their choosing. Professional examiners drawn from industry (critics, curators directors, producers, and so on) then mark these projects and those written analyses. Those who successfully make to the second round prepare seven-hour written screenwriting tests. Finally, the candidates selected for the third round undergo oral examinations or cross-examinations conducted by jurors associated with the school (presumably tutors and former students). All this, though, is kept deliberately vague as Simon's interest is primarily in the jurors rather than the applicants, in the decision-making process rather than those decided upon. A separation between the professional examiners and faculty jurors is observed and it is clear the selection process has been thought through, revised and refined down years. The selection process is not an exact science, though, and the film is at its most fascinating when strong disagreements, often based on personal reactions to individuals, occur among them. Inevitably, some jurors are more detached, 'objective' and sympathetic than others. Subjective impressions and gut reactions clearly count. Director Laetitia Masson (herself a graduate of La Fémis) says: 'We may be using false premises' and admits what they're looking for is 'intangible'. As in On Call, we're in an arbitrarily discriminatory world. We see exclusively white middle-class jurors discuss diversity - fleetingly, almost mockingly. We hear one juror say 'we can't be populist'. We witness them express doubts about 'a spoilt brat' and a 'country bumpkin'. We come to share their doubts about the selection process. Surely, we think, the (seemingly) nervous applicant who talks at length about a Grémillon retrospective at the Cinématheque will be received with open arms. He is. We fear the black applicant whose mind goes a blank when asked to name a few favourite films won't make the cut. She doesn't. When the film winds down with a group photocall for the 60-odd successful candidates, we scan those assembled for familiar faces. Unsurprisingly, but shockingly, it is a solid bank of white bourgeois and haute bourgeois faces. The Graduation raises pressing questions about diversity, the transferral of inherited cultural capital, and, inadvertently, about the French film industry. When we discussed it with her during the festival, she acknowledged Frederick Wiseman as a key influence, located herself squarely within the tradition of Direct Cinema, and said she felt the film had been 'sold' under false pretences in the festival programme, as a film about film rather than about power and processes. Her compelling film suggests (sotto voce, for she is embedded) that La Fémis is a self-perpetuating elitist institution as class-bound and riddled with racism as the wider society its alumni will one day represent or, better say, misrepresent on screen. The French film industry remains a much-cherished global cinematic powerhouse but The Graduation will give those feeling it has lately lost its way, those tired of complacent rural romps set en plein air in Provençe pause for thought. On Call does so too, if for different reasons. Would Jean-Luc Godard have been selected had he applied for place at La Fémis. Probably. Would working class lads like François Truffaut and Maurice Pialat? Not on your nelly. Would a black applicant like, say, Alice Diop? Absolument pas! The 60th BFI London Film Festival runs from 5th to 16th October 2016.